“I wish I had written this book before I crashed and burned my way through three amazing senior corporate positions. Then again, I was much smarter in those days and probably wouldn’t have read it. 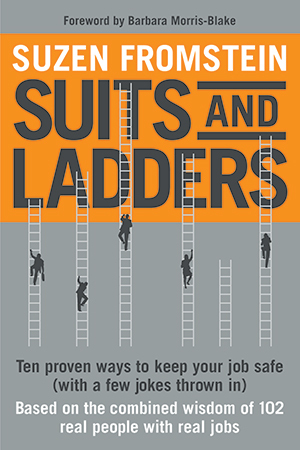 My fervent hope is that you are smarter than I was and that Suits and Ladders: Ten Proven Ways to Keep Your Job Safe helps you do just that,” says Suzen Fromstein. Suits and Ladders is available on Kindle and through Smashwords for all other e-platforms including Kobo, Apple, Sony, B&N etc. There is also a Print on Demand option. 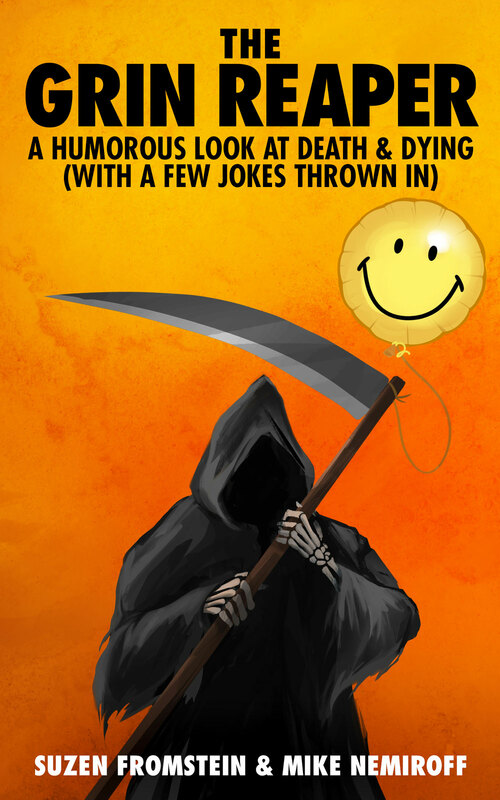 The Grin Reaper – A Humorous Look at Death & Dying (with a few jokes thrown in) co-authored with stand-up comic/musician Mike Nemiroff. The Grin Reaper is available on Kindle and through Smashwords for all other e-platforms including Kobo, Apple, Sony and Barnes & Noble. There is also a Print on Demand Option from Amazon. Fun loving co-authors and first cousins Suzen Fromstein and Mike Nemiroff are known for their tenacity and "never say die" attitudes (except when the Toronto Maple Leafs play). Our subject is death, in its various shapes and complexions, from somberly scary to facetiously funny. The Grin Reaper shines a light on hundreds of thrilling topics like yellow fever, recreational cannibalism, answers to cancers, and many other morbid morsels so ghoulishly delightful you'll want to taste them all before they taste you. "When we can laugh at diseases like cancer, Alzheimer's and AIDS, conditions like sepsis and anorexia, natural disasters and even murder, the concepts are less threatening and easier to contemplate - unless you happen to be one of the victims," Fromstein says. "If you hate comedy, are easily offended or think it is unseemly to laugh at death and disease, don't buy the book! But, before you turn and run, consider this. Where else are you going to gain some insight, some solace, even some laughs, from confronting this one inevitable fact of life?" Want to Inform, Influence & Entertain Like a Pro? Simply Recognize the Seven Deadly Sins of Public Speaking & Then Avoid Them (includes a special section co-authored with stand-up comic/musician Mike Nemiroff on how to add humor to everything), is available on Kindle and through Smashwords for all other e-platforms including Kobo, Apple, Sony, B&N etc. There is also a Print on Demand option. Engage upper management long enough for them to warm to the merits of your process innovation or cost saving idea. Avoid suffocating the audience's interest with inane, lackluster loquaciousness. Have the last word in an argument about who comes first in your office relationships (don't try this at home). Fromstein co-authored this section of the book with stand-up comic Michael Nemiroff. 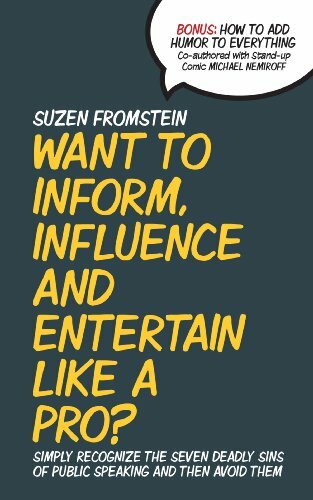 Fromstein and Nemiroff show you how to use humor appropriately to engage your business audience. In addition to many examples sprinkled throughout the text, there are a number of actual speech scripts in the Putting Theory Into Practice section.